Come check out why futures traders find the Daily Technical Overview a vital tool in there trading stratagem, helping them make sound decisions for their portfolio. Futures trading is a difficult world to navigate. Helmscom offers a trading sheet to support brokers or individual traders with a system based trading model. Helmscom has been closely associated with Global Research & Investments LLC to help provide tools for technical futures traders. Consider visiting the GRI website. 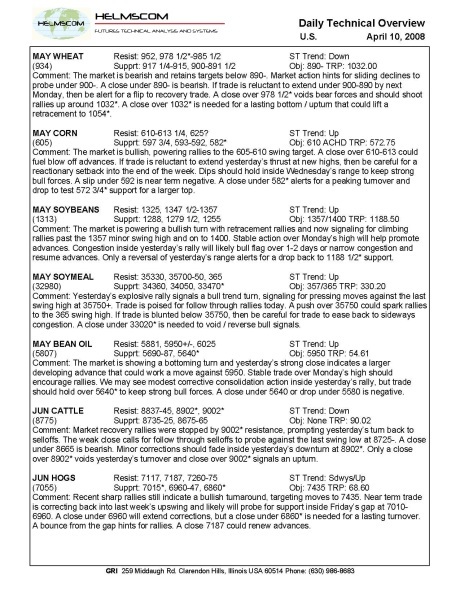 Daily Technical Overview publication, highlighting important technical signals and points for major US futures markets in a concise, easy to read format. Our in house technician interprets market action to keep you focused on the important changes in trend direction and guide your trading decisions. The HVH Trade Sheet provides a systematic method to invest with higher volume futures markets to capitalize on swing moves using proprietary indicators to identify high probability trend turning intervals and special attention to the application of reasonable adjusting risk management. Helmscom is a research and system trading model firm, formed in 2011. We combine computer trading systems with the publication skills and interpretive technical analysis of John Helms’ offering a quick reference report for professionals in the futures markets worldwide and additionally trading system output for subscription use with select brokerage firms. Helmscom has partnered with GRI for over 15 years, working together to publish quality technical analysis tools for futures traders. Consider visiting GRI and see if their research products will bolster your trading.